Visual Basic is very easy to learn because, unlike other programming languages, Visual Basic uses keywords that closely resemble English. Creating a Windows application ordinarily requires you to write lengthy and complex code. But Visual Basic 2008 relieves you of this task. It enables you to create an application and its components literally with the click of a button or menu item. It even writes all of the necessary code to get the application started for you. You can view and fine-tune the code, but it spares you a lot of the grunt work. While the Visual Basic programming language helps you write a Windows application, you still need to write code and be able to plan your application. This course will show you how. You'll learn the building blocks of programming, including using variables, control structures, and loops. You'll find out how to use the large function library built into Visual Basic 2008, including the .NET Framework, as well as how to write and use your own functions. You'll learn how to use the large and varied library of controls Windows offers. And you'll learn how to access files and handle errors. Since Windows applications are event-driven and everything in Visual Basic 2008 is treated as a programmable object, you'll also find out about event-driven and object-oriented programming, concepts important not just in Visual Basic, but also in other programming languages you may want to learn in the future. About the ExpertRating Online Visual Basic 2008 Skills Course (Introductory) instructor : Jeffrey A. Kent is a Professor of Computer Science, teaching both traditional and online classes. He has taught a number of computer programming languages, including C, C++, Java, and Assembly, but his favorite is Visual Basic. He has authored several computer programming books on Visual Basic, the most recent being Visual Basic 2005 Demystified. He's also an attorney, and has combined both careers by writing applications for law firms. Course requirements: Required: Visual Basic 2008, free Express edition (software must be installed and fully operational before the course begins); Computer with Windows XP, Vista, Server 2003 or Server 2008; Internet access, e-mail, the Microsoft Internet Explorer or Mozilla Firefox Web browser, and the Adobe Flash and PDF plug-ins (two free and simple downloads you obtain at http://www.adobe.com/downloads by clicking Get Adobe Flash Player and Get Adobe Reader).Prior programming education or experience is not a prerequisite. "Enjoyed the Visual Basic course, and learned a lot about program usage." "I appreciate the time and effort that the instructor put into the lessons for the Visual basic course. "Excellent Visual Basic class! I had very little time to learn Visual Basic for a new job. This class met all of my expectations. I started my new job last week (just before the class ended) and I am almost done with my first small project. The 6-week format was ideal. Thank you so much!!!" "I really enjoyed this Visual Basic class. I will take a lot of information away with me. Great Class!" ExpertRating is one of the world's only ISO 9001:2015 Certified companies (from TUV America) offering an Online Visual Basic 2008 Skills (Introductory) Course (leading to ExpertRating Visual Basic 2008 Skills (Introductory) Skills Certification). When you choose the ExpertRating Online Visual Basic 2008 Skills Course (Introductory) you can be sure that you are buying a premium International certification that is recognized by hundreds of employers and Government bodies in the US and other countries. With ExpertRating you get certified quickly online and you are equipped with a store house of information through the in-depth ExpertRating Online Visual Basic 2008 Skills Course (Introductory) Courseware which has been developed by experienced Visual Basic Experts. The ExpertRating Introduction to Visual Basic 2008 Skills Certification (Introductory) is by far the best value for money instructor led Program at $129.99. How much does the ExpertRating Introduction to Visual Basic 2008 Skills Certification (Introductory) cost and what does it include? You can buy this ExpertRating Online Visual Basic 2008 Skills Course (Introductory) leading to ExpertRating Introduction to Visual Basic 2008 Skills Certification (Introductory) at a special offer price of only $129.99 which includes the in-depth ExpertRating Online Visual Basic 2008 Skills Course (Introductory) Courseware and exam fee. This is the best value for money Visual Basic 2008 Course available till date. You get the following services within the USD $129.99 fee. In-depth ExpertRating Online Visual Basic 2008 Skills Course (Introductory) Courseware including scenarios and case studies. 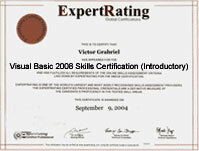 World wide airmail delivery of the hard copy ExpertRating Introduction to Visual Basic 2008 Skills Certificate. The Certificate can be used to prove your certified status and does not mention the words "online". The process of getting yourself certified is very simple. All you have to do is buy the ExpertRating Online Visual Basic 2008 Skills Course (Introductory) for $129.99. Log in to the instructor led course using your password. Go through the ExpertRating Online Visual Basic 2008 Skills Course (Introductory) Courseware (which would take you 6 weeks) and complete the final ExpertRating Introduction to Visual Basic 2008 Skills Certification (Introductory) exam at your convenience. You can complete the exam within 2 months of buying the Certification. The result of the exam appears as soon as it is completed, and Certificate is mailed immediately. The final exam is fully based upon the ExpertRating Online Visual Basic 2008 Skills Course (Introductory) Courseware that is provided along with the Certification. If you have gone through the courseware properly you should not have a problem clearing the exam. The exam consists of multiple choice questions from all chapters of the ExpertRating Online Visual Basic 2008 Skills Course (Introductory) Courseware. ExpertRating instructor led courses commence every month, you can always choose a suitable date for your course commencement in any month. To see available course start dates, please click on the "Buy the ExpertRating Online Visual Basic 2008 Skills Course (Introductory)" link . All courses run for six weeks, with a two-week grace period at the end. Two lessons are released each week for the six-week duration of the course. You do not have to be present when the lesson is released, but you must complete each lesson within two weeks of its release. Visual Basic is the most widely used programming language for creating Windows applications. Visual Basic is an object oriented computer language which is a boon for software developers. The syntax of Visual Basic is similar to the English language which makes the Visual Basic code very clear and readable. The Visual Basic programming language gives strongly typed semantics which perform all kinds of checking at compile-time and disallow runtime binding of method calls. Visual Basic blends BASIC, the only programming language meant for beginners with a totally discerning drawing program that helps to develop useful user interfaces without having to write a single line of code. Visual Basic Course helps to create graphical applications and build Windows and Web applications. The ExpertRating Visual Basic Certification will help boost your resume by equipping you with knowledge to create graphical user interface applications. What's the best way to learn Visual Basic programming? Well, you have to write programs, of course! And your first step toward writing your first program is to install Visual Basic 2008. So in our opening lesson, you'll learn which of the different editions of Visual Basic 2008 might be right for you and how to install it on your computer. After that, we'll walk through creating your first Windows application program while we discuss how a Windows application works. In the first lesson, you were able to create a working Windows application with just a few mouse clicks. In this lesson, you'll find out what Visual Basic 2008 did behind the scenes to help you create that application. You'll also learn about properties, which are characteristics of an object—such as its size and color—and how to change those properties. Windows applications are all about events, such as the event a user causes just by clicking a button in the application. Learn about event procedures. Then you'll get your feet wet in Visual Basic by writing your first code. So far, we've been focusing on the form, which is perhaps the most important part of a Windows application's graphical user interface (or GUI). However, a form's primary role is to host other controls that enrich the GUI of Windows applications—menus, toolbars, buttons, text boxes, and list boxes. In this lesson, you'll find out how to add controls to your form, and how to write code for these controls. Most computer programs store information, or data. Learn all about data types, which represent different varieties of data (such as numeric data or text data). Then we'll go over how to store that information in a variable. As a former professional chess player, I've marveled at the ability of some computers to play world champion chess players on even terms. But once you understand that computers can calculate far more quickly and accurately than people can, it's easy to see how they're able to outplay the best players. In this lesson, you'll discover how to harness the computer's calculating ability using arithmetic operators. As your programs become more sophisticated, they'll often branch in two or more directions based on whether a condition is true or false. For example, a calculator first needs to determine whether the user chose addition, subtraction, multiplication, or division before performing the indicated arithmetic. Learn how to use comparison and logical operators to determine a user's choice. Picking up where Lesson 7 left off, once you know the user's choice, you'll want to execute different code based on that choice. In this lesson, you'll learn how to use If and Select Case statements to execute alternative code statements. When you were a child, your parents may have told you not to repeat yourself. But sometimes your code needs to repeat itself. For example, if your application's users enter invalid data, your code may continue to ask whether they want to retry or quit until they either enter valid data or quit. Explore how to use loops, which repeat code execution until a condition is no longer true. Then we'll delve into arrays, which may hold multiple values at one time, and work very well with loops. Many textbooks are several hundred pages long. Imagine how much harder a textbook would be to understand if it consisted of only one very long chapter, rather than being divided into manageable sections? In this lesson, you'll learn how to similarly divide up your code into separate procedures. When I finish writing something for the evening, I close my word-processing program, and I might even shut down my computer. Of course, the next evening I don't have to start over. What I wrote the previous evening is preserved. However, up until now, our programs haven't saved data so that it's available even after the application exits. Discuss how to write code that reads from and writes to a text file in order to preserve the data. You'll also learn how to add Open and Save dialog boxes, such as those used in sophisticated programs like Microsoft Word, so you can open a text file to read from it and save to a text file to write to it. Nobody's perfect, right? Well, your applications won't always run perfectly either. Sometimes they'll stop due to a runtime error, also called an exception. In our final lesson, you'll find out how to prevent and handle exceptions.